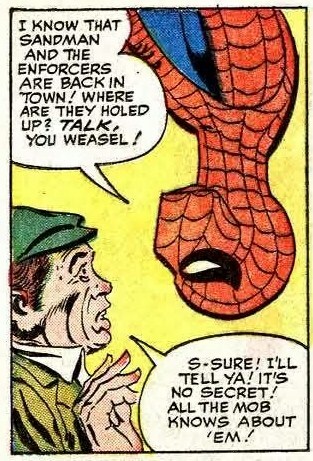 “Wheatcakes” are simply pancakes made with buckwheat flour, so these are presumably the same breakfast food that Peter Parker liked so much in Amazing Fantasy # 15.
p9 “All hail the Spider, a hardy breed is he”. This sound like it should be a parody of a popular song, but I can’t work out what Stan has in mind: can anyone help? These are both arguably references to hymns. 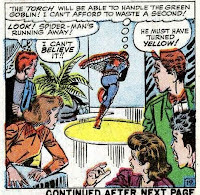 (”Father, lead me day by day / ever in thy own sweet way” “Count your blessings, one by one.”) Perhaps part of the Spider-Man / Torch feud is a clash between their Jewish and Protestant heritages? 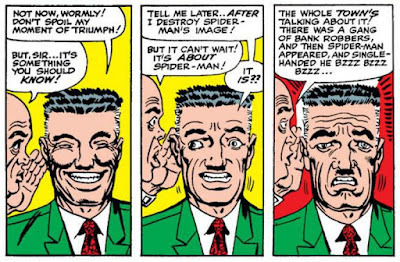 Jameson thinks that the pictures of Spider-Man fighting the Enforcers are “sensational”; so he probably gets the same $2,000 he did for the pictures of the Vulture. One of the wrongest things which has ever been said (by Andrew Garfield, among others) is that Spider-Man is a Christ figure. The Jesus-story is about a divine being who condescends to come down to earth from heaven to be our Saviour. 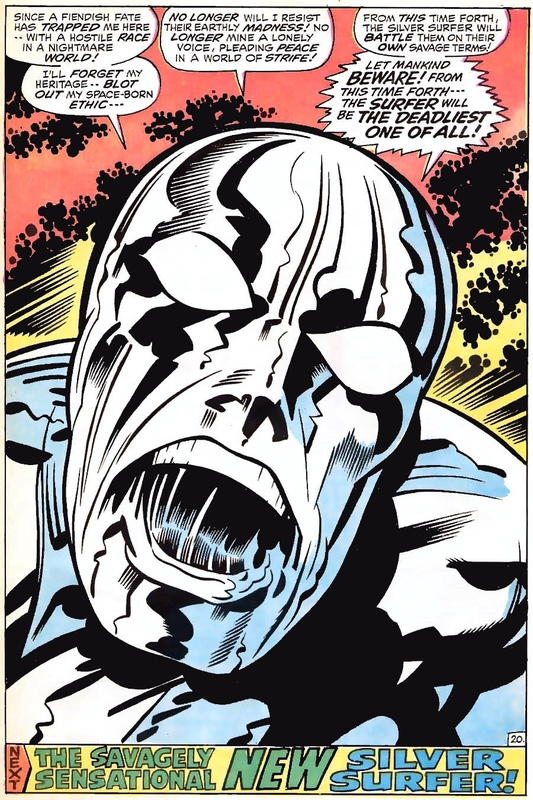 That’s why characters like the Silver Surfer and Adam Warlock and Superman (who have supernatural origins and come from the sky) find it so hard to avoid being Christ-like. 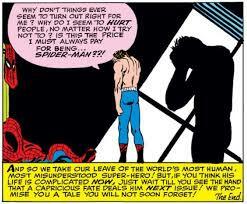 Spider-Man doesn’t descend from heaven; he pulls him self up from the earth. On webs. Which he made in his bedroom. His story is about an all-too-human Everyman who struggles to do what is right with the hand that life has dealt him. His situation isn’t fundamentally different from yours or mine. If it were, we wouldn’t be very interested in it. 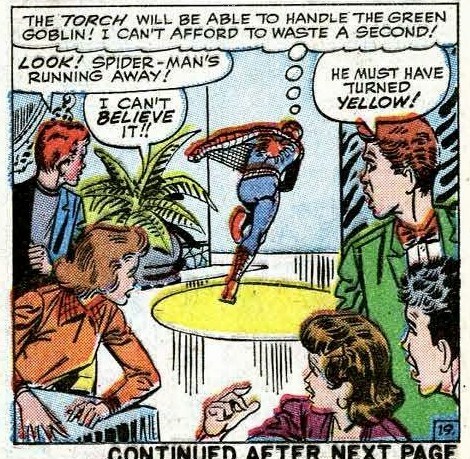 Spider-Man changes his mind and swears that he will remain Spider-Man forever. And most versions of the story do indeed contain a de profundis moment. Long before Joseph Campbell turned the whole thing into colossal bore, Northrop Frye (a proper literary critic, who was examined by C.S Lewis) had argued that heroic stories typically have a V shaped pattern of descent and ascent. This could be literal — a hero might go down and face an enemy in a cave, or a dungeon, or an undersea base, or a giant glass fish-bowl and then come up into the light. But it could also be metaphorical — a hero might descend to the depths of despair and then have his faith and confidence restored. That “V” movement of descent and ascent does have a structural resemblance to Christ’s Passion and Resurrection, even if the hero in question is very un-Christ-like indeed. Frye called these kinds of romances Secular Scriptures, although perhaps he would have been better off saying that the Gospels are sacred romances. 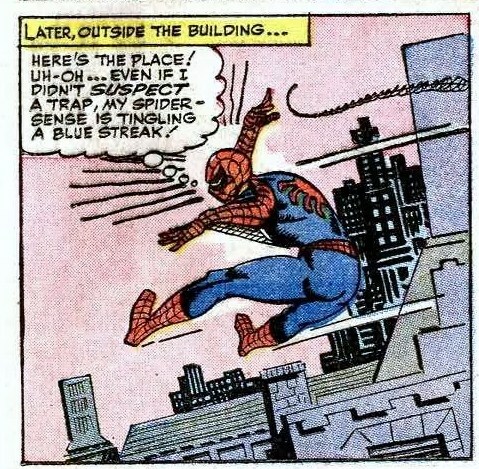 Many of Spider-Man’s greatest adventures clearly do have that “V” shaped structure. And many of his finest moments do take place at the nadir of the “V”. It’s when he doesn’t have any powers and faces Electro anyway that he is most like Spider-Man; it is when he has chucked his Spider-Costume in the dustbin that he realizes who he irreducibly is. 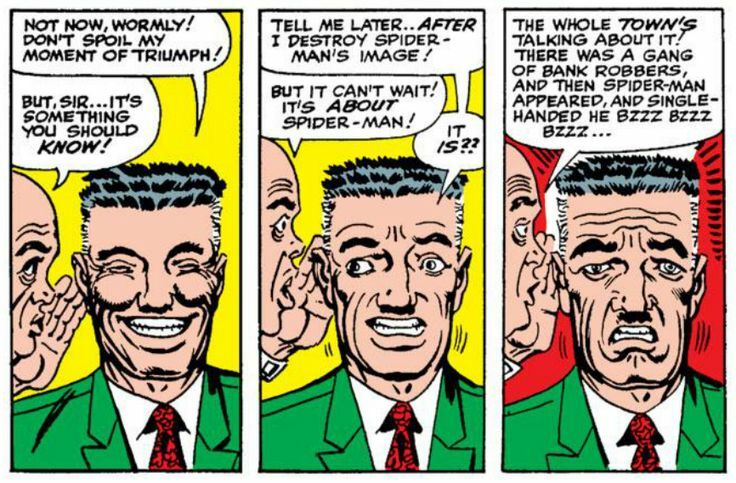 The Sinister Six story has a moment when he very nearly calls out "my powers, my powers, why have you forsaken me?" 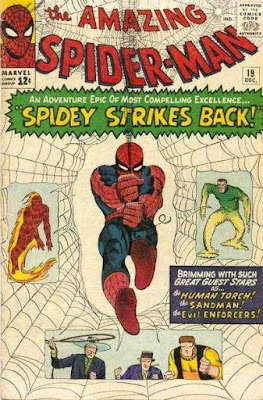 Spider-Man #19 is not as highly regarded as the other two stories in the triptych: but it is essential, and a marvelous comic in its own right. Together, the three parts show us the fall and rise of Spider-Man in beautiful slow motion. 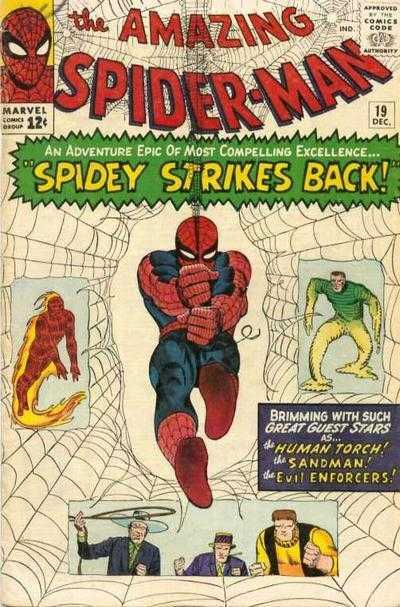 Amazing Spider-Man #17 showed us Spider-Man humiliating himself in front of the biggest audience possible; #18 showed us him at the very depths of despair; so issue #19 has to show us a truly confident Spidey bouncing back, and showing the Human Torch a thing or two. 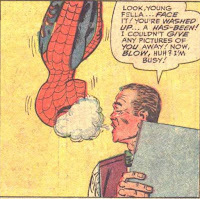 Stan Lee’s claims about “non stop action” would normally presage an extended fight scene — but the truth is that this issue is more violent and kinetic than the comic has been in months. 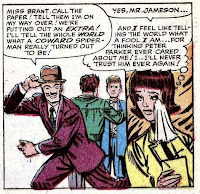 Ditko seems to be reveling in the Spider-Man-ness of Spider-Man. 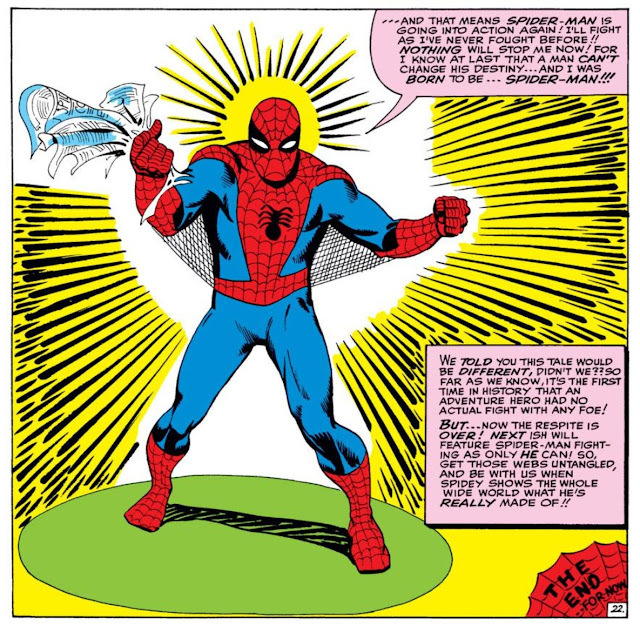 The character can too easily become merely a strong guy with a web-shooter-full of plot devices; but Ditko spends this issue thinking of new poses for Spider-Man to strike and new angles to look at him from. Instead of taking it for granted, we keep being surprised and delighted by the fact that Peter Parker can stick to walls. 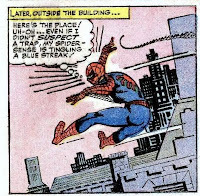 Look at the choreography of the fight against the Enforcers and the thugs on page 8: Spider-Man on the ceiling, on all fours. Spider-Man spotted by the Enforcers, now sticking to the ceiling with just his feet. Ox throwing Montana at Spider-Man, knocking him down. 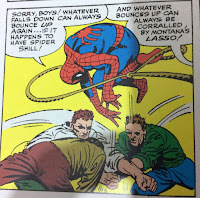 Spider-Man landing in a handstand position; three thugs running at him from different directions; Spider-Man springing up again so the thugs knock each other out. Granted, the “jumping away from two guys who are running at you” motif has been used before: and it probably works better in slapstick than an actual fight. 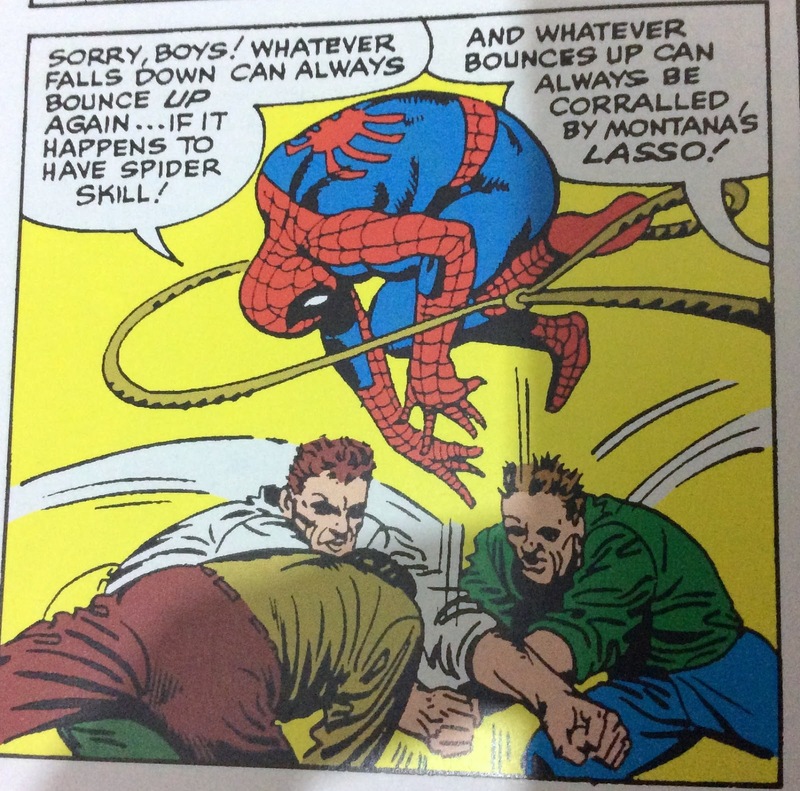 But quite brilliantly, Montana catches Spider-Man in his lasso as he jumps — so Spider-Man escapes from one peril (the thugs) and into another (Montana) in a single frame. 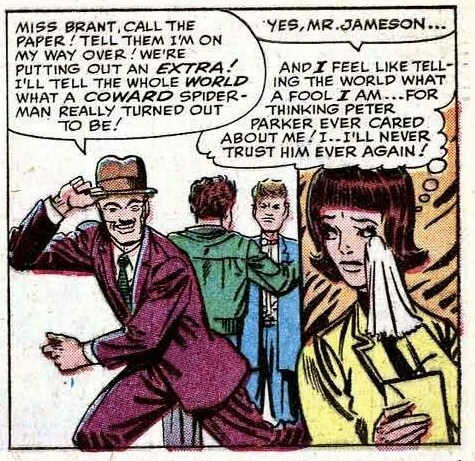 Lee and Ditko are delivering on the promise made at the end of last issue. Spider-Man really has dropped the self-pity. 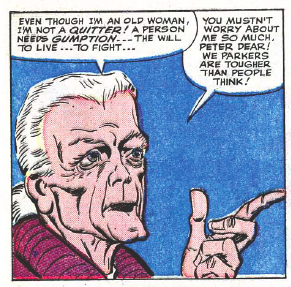 He’s kind and funny with Aunt May ("what’s a pretty young girl doing here in my Aunt May’s kitchen?") 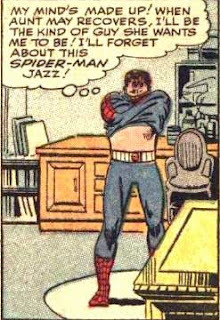 relaxed with Flash Thompson ("I heard the whole routine before, I could recite it by heart!") and only mildly unpleasant to J.J.J. ("Sometimes, I suspect that man just doesn’t like me!"). 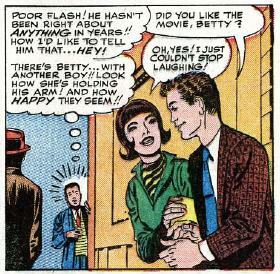 Betty remarks that “he seems to have a new confidence in himself”. As a story, though, there is not very much to it. 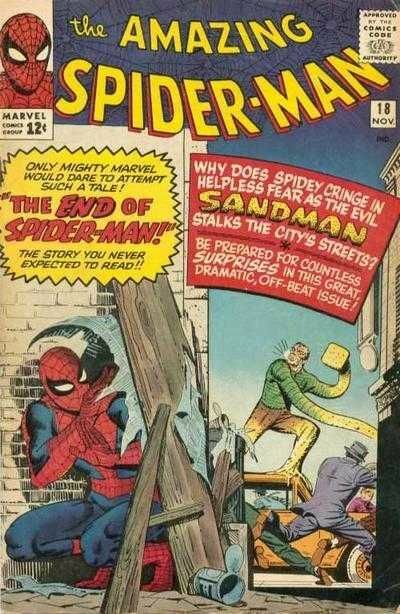 The Sandman, who Spider-Man ran away from last issue, teams up with reliable division-two baddies the Enforcers to kidnap the Human Torch. They cleverly use asbestos rope to pull him down; chemical foam to douse his flame; before Sandman deposits him in a specially constructed glass jar – which lets in just enough air to keep Johnny alive, but not quite enough to let him 'Flame On'. (It would be interesting to know who constructed all this hardware — the Judo expert, the Big Strong Guy, the Rope Trick Guy, or the Habitual Thug Who Never Finished High School?) But of course, Spider-Man comes along and rescues the Torch — which is a kind of pay-back for all the times he's been upstaged by him. In January 1964, Spider-Man threw away his glasses and punched Flash Thompson. 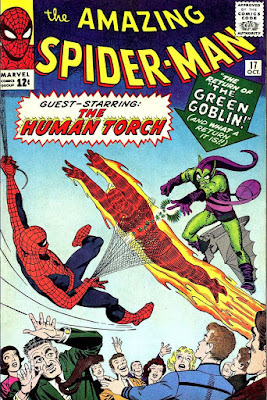 The Return of the Green Goblin, The End of Spider-Man and Spidey Strikes Back bring the year to a triumphant end. They tell us the tale of a hero who loses his confidence, regains his confidence and bounces back just about as well as it could be told. But we are left with a dangling question. Has whiny Pete really quit the stage for good? Is this new, self-confident Peter going to be who the comic is about from now on? Or will we have to go through the whole thing again this time next year?